Web Elements in Web Environment, Operations on Web Elements, Inspecting Web Elements and Element Locators for Selenium. Web Elements like edit Box, Link, Button, Radio Button, Check Box, Combo Box, Image, Frame and Web Table. 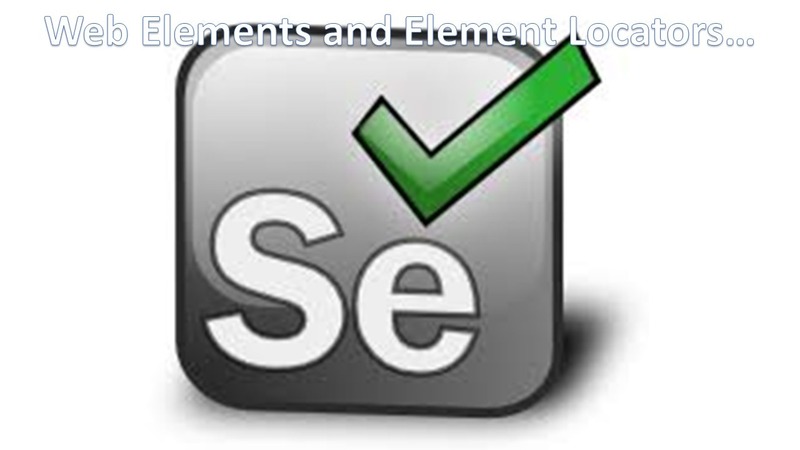 Selenium Element Locators like id, name, className, linkText, partialLinkText, cssSelector and xpath. Inspecting Web Elements to recognize the elements during Automated Testing. > Check if the check box is displayed or not? > Check if the check box is enabled or not? > Check if the check box is Selected or not? > Verify if the Radio Button is Displayed or not? > Verify if the Radio Button is enabled or not? > Verify if the Radio Button is Selected or not? > Check if the Drop down is enabled or not? > Locator is an address that identifies a web element uniquely within the webpage. Locators are the HTML properties of a web element. to find elements on Web pages. Why we need to use different locators? 2) Some locators may be duplicated. So we have to choose any one unique locator to recognize the element. Download and install Firebug and Firepath plug ins/Add ons for Firefox Browser. If it Internet Explorer or Chrome, we no need to install any Add on, they provide built -in Developer Tools (F12) to inspect elements. Element Locators are common for all Browsers. Xpath in XML document shows the direction of software web application’s element location.